Events have moved at an astonishing pace, and today we find ourselves covering Iain Duncan Smith’s resignation. Some have described it as a change of heart, and the internet is full of people understandably doubting his sincerity. Why would he draw the line at PIP cuts, they reason, when he has pushed through reductions to ESA, championed the work programme and staked his reputation on Universal Credit? These are all measures seemingly designed to make life immeasurably more difficult for sick and disabled people. IDS saw the social security system as a barrier to this project: a complex and slow-moving tangle of inducements to sit about and do nothing. He even viewed Tax Credits – brought in, let’s remember, to incentivise low paid work – as part of the problem. Theoretically, it could allow working families could coast along on a minimum of part time work, rather than strive to be more productive. IDS’s solution was to abolish all means tested benefits and replace them with one “Universal Credit” which would put everyone under the cosh of their own “claimant commitment”, subject to benefit sanctions if they failed to meet its demands. Depending on the claimant’s circumstances this could be anything from occasional work focused interviews to several weeks of unpaid labour. A moment’s thought will tell you that this sort regime is not a “cut”. It is complex to set up and expensive to administer. 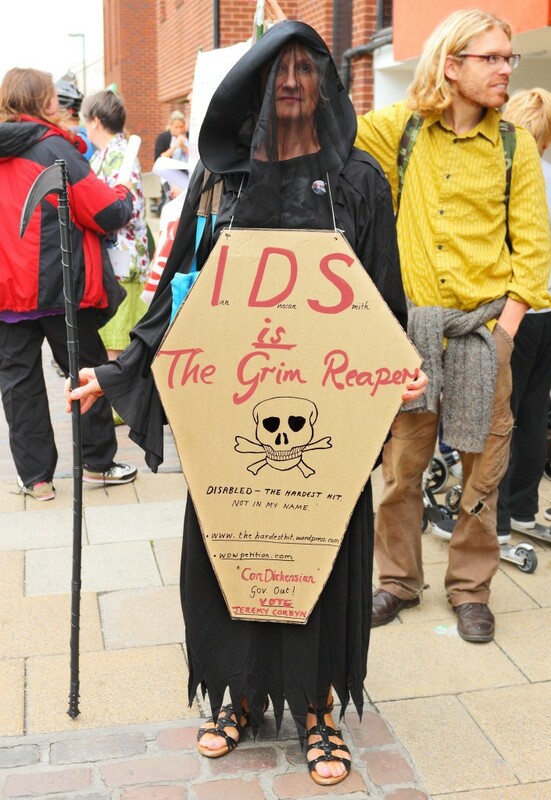 IDS should not be thought of primarily as a hatchet man. We should think of him instead as a sort of anti-Beveridge. Instead his famous “Beveridge Report” proposed an elegant, internally-consistent system of cradle-to-grave coverage encompassing healthcare, education, social security and legal aid. He is remembered as a hero. IDS imagined his trajectory in similar terms, except that instead of creating the welfare state, he would take the bloated system that the welfare state had become, strip it down and recreate it as neoliberal machine for behavioural change, priming working class people for their role in a deregulated and casualised economy. IDS refers to his vision being “compromised” and this is exactly right. You cannot implement a punitive welfare panopticon at the same time as budget cuts. His plan is in tatters. So-called “Universal Credit” is now so universal that only 175,000 claimants receive it nationally. IDS himself is bitterly angry that the Work Programme has been “salami sliced” and refers to it in his letter of resignation. This rings true. What kind of a person would invent a new benefit and then cut it, before it has even been implemented, unless external pressure was at work. IDS has done this twice: with Universal Credit and then again with PIP. IDS is not concerned about disabled people, but he has not claimed to be. On his own account, he is resigning due to the impossibility of implementing “the government’s vision of a new welfare-to-work system” during a period of self-imposed austerity. His resignation letter rings true, and cuts to the heart of this Tory government’s failure: needless cuts are even undermining the pet projects of the party’s right wing. Makes me wunner whits roon the corner fur the disabled and unemployed , something worse no doubt , mibbe ejection fae London which has been on the kerds for a while. Work camps? Work to benefits?Or even time limited benefits like other countries have already? Seem to remember reading aboot Finland doing a new benefits thing , something named like universal credit , where everyone , worker , disabled and unemployed was guaranteed 400 euros a week income , but I doubt that will even come out of the long grass even in Finland. Don’t forget in all this mess IDS did not go to the ‘correct’ school and is Scottish by birth (born Edinburgh). Not to mention RC. I’m not sure what any of that has anything to do with anything? The Liberal Government of Ontario, Canada, is discussing a universal basic income for everyone in the Province. They intend experimenting with it in one town. Under the scheme, benefits for poor people are done away with, and everyone is guaranteed a basic living income regardless of whether or not they work. It is calculated to be less expensive than the system of benefits we now have. Jean-Yves Duclos, federal minister of families, children and social development, of Canada has also mooted the idea. I do hope it is implemented and that it works. I hope that when Scotland becomes independent, the government will put such a scheme into effect. Could the Scottish Government implement it now? For the Tories,welfare is an ideological issue and not an economic one. They are ideologically opposed to social care in any form and believe that the market will take care of everything (there is no such thing as society and so on). Even if you make the case that universal income would save the country money,they would be opposed to it because it does not fit with their dogmatic approach. When you are dealing with a government that is ideologically driven,like England’s Tory administration,there are only a few viable options and in our case that means cuts to public services no matter what. When a former towel folder is appointed as the head economic guru in the government,you know you are in big trouble. I do wonder about whether Duncan Smith’s resignation speech was more to do with the pending Tory leadership contest than anything else. Clearly,he doesn’t want to see Gidiot as PM and I am sure that sentiment is shared by many of us. An excellent analysis. IDS set up his Think Tank founded on his belief that those on benefits are entirely responsible for their own predicament through drug use, alcoholism, chaotic family lives, single parenting etc. Nothing to do with poverty, government policies. I’m glad to see him go. To paraphrase Churchill: the quiet man has a lot to keep quiet about. Ian Duncan Smith is only looking after no. 1 remember call me Dave may go sooner rather than later due to Brexit and if he does then “GIDEOT” thinks he may end up being prime minister but by “I D S s ” resignation blaming “GIDEOT” for the assault on the sick and disabled, hoping that he has damaged/knifed “GIDEOT” in the back at this point in time to ensure that he has no chance of being prime minister and that “BORIS” will make it to no.10 and I am sure that he will have been promised a good position within the government for doing his duty. Remember that excuse has been used numerous times before in ww2 I was just following orders. Pet projects of the party’s right wing? The Tory Party is hard right in its entirety, and IDS and his ‘pet projects’ are of the extreme right. The question now arises as to whether the Tory party now harbours a Social-Darwinist or even eugenecist wing? Denis Healey once promised to squeeze the rich ” till the pips squeak”. Osborne has reversed this by squeezing the PIP’s till the rich (or at least some of them) squeak. Now that is what I call political genius. the main political reason made by IDS in his resignation was that the disabled`s payments were being cut at a time when the wealthy were getting tax benefits. hardly “all in this together”. Being charitable that is the way I took it! No big deal really. The disabled are a burden on society. Either they do what they can do, or they get sanctioned. Duncan Smith’s problem is that Gideon doesn’t hide this agenda. Mind you, the 1930’s Germany had the solution to the disabled. That’s our friends in the Tory Party who Labour stood shoulder to shoulder with in the Better Together campaign. So tell me, who are the Tories – the 55% who voted for this. I give a little leeway to IDS. His main goal was a reform of the system which is complex and does not work well. Differences of a couple of pounds of income can mean that a poor family’s benefit income either falls off a cliff or it is taxed. Osborne has cut welfare benefits throughout the coalition/Conservative tenure to reduce the deficit and IDS has gone along with it. Until now. Sam. I give no leeway to IDS and his kind. They hit the weakest in society because that is what they do. What however my concern is that the people of Scotland voted for this, or at least 55% did. The old adage of Turkey’s and Christmas comes to mind. But that is exactly what 55% did. Bitter Together, you bet. You couldn’t make it up. She’s too busy drooling over IDS replacement, Stephen Crabb, to care. Check her twitter account after his new job was announced. New guy. Same as the old guy. With added antigayness I’m sure Davidson’s friends must find very attractive. IDS is concerned with himself alone. He had his chance as leader of the Conservatives and failed. I think he has made a deal with Boris that will net him more than he would gain by continuing to support Cameron. What that deal is will emerge later: a peerage? some lucrative directorships? well paid sinecures? You can bet your house he will not lose by his recent antics.